"What description of clouds and sunsets was to the old novelist, description of scientific apparatus and methods is to the modern Scientific Detective writer." Raymond Chandler once said of Dashiell Hammett, one of the trailblazers of the Hardboiled School, that he returned murder in the capable hands of those individuals who were not faced by the seamier side of life – committing crimes for a reason and not to provide a body to reinvigorate the reader's interest in chapter XII. The mean streets supplied them with the simply means for murder that excluded the hand wrought dueling pistols, curare and tropical fish, however, quite a few of their literary decedents tugged the hard-bitten private eyes on their sleeves into a more classically furnished environment. Over the course of forty books and stories, Bill Pronzini drew a detailed picture of the life of his nameless gumshoe, resulting in one of the most realistic and well-rounded characters in the genre, but he still stumbles over murders that could have sprang from the imagination of John Dickson Carr (c.f. Hoodwink, 1981). Henry Kane's The Narrowing Lust (1955) has his "private richard," Pete Chambers, confronted with an apparent suicide in a secured room with all the doors and steel shutters locked from the inside and Michael Collins' one-armed shamus, Dan Fortune, grapples with the handle of quite a different locked door problem in the short story, "No One Likes to Be Played for a Sucker." Manly Wellman's Find My Killer (1947) is another excellent sample of taking the tough, street hardened private eye, with a take-no-nonsense attitude, and assign him to a case that should've been entitled The Pistol Murder Case signed by S.S. van Dine. Find My Killer opens with Jackson Yates, an ex-policeman operating on a free-lance basis, dropping by at the office of J.D. Thatcher, a lawyer who turns out to be a woman with eyes that are two different shades of blue, hoping to procure an open spot as a bodyguard for one of her clients. Unfortunately, for him, the services of a bodyguard are no longer required and he's not the only one who's miffed about it. Yates finds one of his would-be-contenders for the job harassing Thatcher and quickly disposes of him in a good, old-fashioned bare knuckle fist fight. Impressed with his quick and effective performance, Thatcher offers Yates a partnership on a job that could very well put a $5000 check in their pockets. Richard Ealing offered this bounty, written down in an official codicil that was attached to his will, to everyone who can find his killer and deliver the proof needed to secure a conviction, but the problem is that his death is being written-off as a suicide – which is sort of a problem when you intend to tag someone for murder. Consider the facts: Richard Ealing drew his last breath in the gunroom, after a slug from a derringer, a short-barreled pistol, hit him in the chest and the weapon was still clutched in his hand. Paraffin tests showed the presence of gunpowder residue on the dead man's hand and the door of the room was locked from the inside. A tough nut that has to be cracked if they want to slap either his much younger wife, her lover, his personal physician or any of the other stock-in-trade suspects with a murder charge and cash in their just reward. Wellman delivered with this novel a text book example that shows how to intersperse hardboiled sequences, in which, for example, our narrator has to go to blows with a dunderheaded homicide cop, with a cleverly conceived plot that contains big chunks of clues – both real and false. Although the clue to the murderer's motive wasn't given until quite late in the book. Anyway, what makes this book, IMHO, special is that the structure of the plot rests on forensic science, such as ballistics and pathology, placing the story somewhat awkwardly in the Scientific School of Detection. But these scientific elements or cleverly exploited, on both sides of the table! As a matter of fact, it's done so well that I can almost forgive him for the routine solution and off-hand explanation of the locked room angle, which was the only plot thread that did not came true to the promise that its premise made and a bit more originality, in combination with the forensic portion of the solution, would've turned this into an impossible crime novel to take notice off. Otherwise, it comes recommended for being a perfect specimen of what was conceived before the shotgun wedding between the Golden Age Detective Novel and the Hardboiled Private Eye Story. "But, my family being what it is, even those short periods furnished plenty of incidents that might have been the prelude to a murder..."
When you closely scrutinize the list with names of novelists that have one or more detective stories to their credit, it's not always an inexplicable enigma how a bunch of them ended up, knee-deep, in the boggy mire known as biblioblivion and are sinking ever deeper with each passing year. They may have had a feeble grip on their plots or sketched their characters without turning them into portraits. Their dialogue may have reverberated with the buzzing of insipid babbling or they were competent, but lacked that modicum of originality necessary to stand out in the crowd. On the other hand, if you see a writer trudging through that slough and bog who had everything, from a way with words that gave the illusionary thumbing of a heartbeat to their characters to a surprisingly effective and novel way to tackle plotting, you can't help but stare in disbelief as they slog pass you. 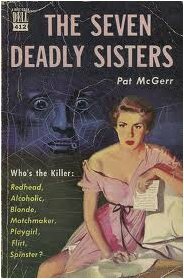 Pat McGerr was one of those mystery writers who had the ability to draw convincing characters, construct ingenious plots without being over-elaborate and presented them in an unconventional way – which also had a surprising touch of realism. McGerr reasoned that the basic formula, for penning a traditionally-styled whodunit, hinges on figuring out whom of the suspects planted a dagger in the neck of the body, but what if a detective story kicks-off with divulging the identity of the culprit and you have to work your way back in order to figure out who was murdered? 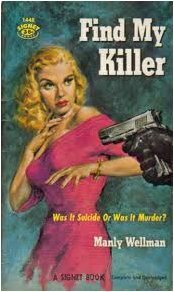 This simple reversal allows a writer to turn even the simplest of crimes into genuine puzzlers and her first effort with this plot device, Pick Your Victim (1946), is one of the authentic masterpieces of the genre, but McGerr outdone herself with her second novel, The Seven Deadly Sisters (1948), in which we are unaware of both the identity of the murderer and the victim – an absolute gem of a who-was-done-in-and-by-whom! Sally Bowen has moved with her newly acquired spouse, Peter, back to his native England to settle down and start a family of their own, but a frantic letter from a friend, expressing condolences and sympathy over the fact that her aunt committed suicide after poisoning her uncle, throws a sizeable peddle in the tranquility of her mind – especially since the letter neglects to mention any names. The problem is that Sally Bowen has seven aunts who are all, more or less, unhappily married and equipped with adequate motives to act on the "till death us part" line from their wedding vows. The oldest sister, a determined matchmaker. Her domineering tactics force all of her sister in more or less unhappy marriages. The schoolteacher sister, remains a spinster into her thirties. She finally marries a man younger than herself. The shrewish sister, is a redhead who makes life miserable for two husbands. The weak sister, was maneuvered into an unhappy marriage and finds solace in the "magic bottle." The beautiful sister, is a free-lance artist. Too much prodding toward matrimony has made her afraid of men. The glamorous sister, very frankly likes men, and she doesn't let the conventions cramp her style. The youngest sister, is only a few years older than Sally. She has been spoiled by too much indulgence. The knowledge that one of her aunts poisoned her husband without knowing which one prevents Sally from immediately establishing contact with the home front, but the uncertainty wages a war with her peace of mind and begins to tell her husband all about her family during an all-night conversation – from which a picture emerges of a family that could've been a happy one if one of them didn't do all the wrong things for all the right reasons. This on-going flashback covers a period of several years and tells how most of the sisters were married off to the wrong husbands, recounting heated domestic disputes and uncovers underlining relationships that could've been lifted from the storyline of a second-rate, mid-day soap opera, but the way in which McGerr exploits these elements is everything but corny – and would make for a great television drama! But within this narrative there are also a few neat clues tucked away, accompanied with some clever misdirection, but I have to beat my own drum, once again, for being extremely lucid in picking up on all the hints and pointing the finger at the murderer before arriving at the final chapter, however, this took nothing away from a very effective conclusion – which felt both logical as well as an inevitability. The only part that gave me pause for thought was the feasibility of Sally being able to give her husband an accurate, detailed and uncolored account of events stretching back several years that provided him with the information needed to positively identify the murderer and her victim, but if you can accept that premise you have a brilliantly executed and original detective story on your hands. I recommend this one without hesitation. I have one more Pat McGerr novel on my to-be-read pile, Follow As the Night (1951), but I will safe that one for the one-year anniversary of this blog – which began with a review of her first novel. In the introductory chapters of Locked Room Murders and Other Impossible Crimes (1991), Robert Adey compiled a comprehensive summary of this particular sub-genre and underlines notable works from established novelists and writers whose names have dimmed in our collective recollection. 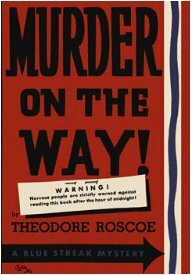 One of these unnoticed, fleeting shadows from the past, whose career lays in the same negligent state as that of the crumbled remnants of a headstone, is a "seasoned wanderer" named Theodore Roscoe – who wrote part of his masterpiece, Murder on the Way! (1935), on a candle-lit cemetery near Leogane! If that doesn't set the mood, nothing does. This barbarous and grotesque narrative embarks on its grim journey when the two main protagonists, artist Edwin Cartershall, who also narrates the story, and his fiancé-to-be, Patricia "Pete" Dale, receive a late-night visitant, a character plucked from the fantasies of Lewis Carroll, named Maître Pierre Valentin Bonjean Tousellines – who contented himself with the title of Comte de Limonade. Tousellines introduces himself as the solicitor of Pete's uncle, Eli Proudfoot, recently departed from this world, and invites them to tail him back to the decaying chateau of his late employer, situated in Morne Noir, Haiti, for the final rites and the reading of his will. Uncle Eli shuffled off his mortal coil in the confines of his moldering library, where his remains were found slumped in an armchair with a bullet hole defacing his visage, and the local authority, represented here in the presence of Lieutenant Nemo Narcisse, of the Garde d'Haiti, presumes that the man robbed himself of his own life. However, the absence of a gun also leaves him with the option of murder, but only seems to have considered this possibility with the scourge of the local inhabitants firmly set in his mind – the voodoo-driven zombies of Haitian legend! "A zombie, m'sieu, a zombie is one who has died but is not yet dead. A corpse resurrected by witch’s doctors magic from the grave. A living dead man who returns as the slave of some master, who may labor in the field or walk with silent steps on errands of revenge." But the scenes awaiting them at the dilapidated, colonial chateau, where the rhythmic rumbling of ceremonial drumming, emanating from the wilds encompassing the estate, never ceases, can be best described as the drug-fuelled phantasmagorias of an opium addict. There's the unconventional funeral of Uncle Edi, prepared for burial according to Haitian voodoo rituals, and the reading of a will – which turns all of his prospective heirs into pawns in a game with a one hundred thousand dollar inheritance as the big prize. The assortment of potential heirs, aside from Dale and her artistically inclined friend, could've been escapees of a freak show, especially when hurdled together in one room, and between them there are enough murders to furnish a new wing for the black museum. These seven blood hounds that follow murder in his footsteps are a British peer who has done a twenty-year stretch for murder, a tattooed deserter from the United States Navy, a Dominican with bloody hands and no tongue, an Albino youth with an attitude, a one-armed Jamaican witch and her half-wit son named Toadstool and an exiled German bluebeard who was an embarrassment to the home front. The only thing they have to do in order to procure the inheritance is simply staying at the chateau for twenty-four hours after the funeral and they can ascent the list if the person ahead of them in the line of successors leaves or croaks! Murders, resurrections, impossible disappearances, rebel uprisings and hair-raising situations tag each other in and out at a frightening and dazzling pace. Murder on the Way! clues us in on what And Then There Were None (1939) would've been like if the names of John Dickson Carr or Hake Talbot were plastered across its front cover. Theodore Roscoe does not only share their taste for Grand Guignol, but also their gift for conjuring up an apparently demon haunted world where everything is possible – even the impossible! At one point in the story, the second heir in line, the tongue-less Ti Pedro, is locked into the room where Uncle Eli used to store his rosewood coffin and that storage room pretty much amounts to a plastered and sealed room – without any easy entrances or escape routes. The door was locked from the outside, with the solitary key in constant possession of a police officer, while an interconnecting door was nailed shut and the only window was covered with undisturbed cobwebs, but despite these obstacles someone managed to shoot him through the top of his head. Later on, the shadowy murderer vanishes from a dead-end point in a subterranean tunnel and Roscoe explains these miracles of black magic away with the same ease as the sun shoos away the stars at dawn. The only thing that marred the pleasure for this reader was my own cleverness at picking up on nearly all the clues that helped me identify the murderer earlier on in the story, but what an enterprising and spirited murderer with a truly original scheme that anticipates a rather famous cartoon series. This is nothing short of a bloody tour-de-force and an unapologetic flight of fancy, which does a breath taking job at merging the plot of a fair play mystery with components of thrilling tales of adventure and making it feel like a horror story. Readers who prefer their detective stories with an air of literacy are best advice to stay out of its way. This is genre fiction in its purest, undistilled form and only recommended to habitual users. "At the age of eight, he was the author of a thrilling mystery, 'The Sheriff of Red Roach Ranch,' published in a hand-bound edition limited to one copy." I can only imagine the number on the price tag of that book, if it ever appeared on the second-hand book market. "Always remember, it's a trick. Keep that in mind and you can figure out how it's done." One thing that has confounded me, ever since I read about it, years ago, is how the man who delivered Sherlock Holmes into this world, the embodiment of scientific and logical reasoning, turned to the paranormal – suspending his rational faculties and empirical enquiry in order to wrap an aching heart in the false comforts of spiritualism. Well, confoundedness is perhaps not the best word to describe how I think of Conan Doyle's innate longing for life beyond the grave, roused after having laid so many loved ones to rest, but it's not what you'd expect from a man of science and medicine. However, this confidence in the existence of ghosts and fairies, professed by a man who, ironically, was also one of the leading lights in a nook of the literary world that adopted the same skeptical stance towards mediums as one of their biggest detractors, Harry Houdini, turns into a charming characteristic when juxtaposed with the questionable claims made by one of his fellow composers in crime around that same time. 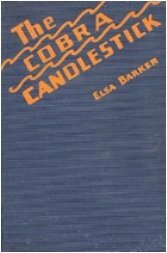 Elsa Barker was a minor name in the publishing industry, who lived abroad during the years leading up to The Great War, but ensured that the memory of her name would linger on with the publication of Letters from a Living Dead Man (1914) – a collection of epistles dictated by a Los Angeles court judge named David P. Hatch after his death in 1912. During the year of Hatch's passing, Barker was in Paris when she begins to feel "strongly impelled to take up a pencil and write" and churned out a stack of letters, which were all signed with an anonymous X – or at least so it appeared. But when this discerning woman of letters learned that X was also a nickname for a judge, back in the United States, she astutely drew the lines to connect the scattered dots and came to the only sensible conclusion: she had become a receptive medium for messages from the spirit world. Over the next five years, Barker ghosted two more compendiums of Hatch's letters, War Letters from a Living Dead Man (1915) and Last Letters from a Living Dead Man (1919), and a book composed of free verses, Songs of a Vagrom Angel (1916), dictated to her by an angel. No. I'm not making this up. These books made quite a splash in mediumistic circles around the globe and there seems to be a resurged interest in them now, but, at the time, the veracity of them was called into question and their intermediating author slowly evanesced from the printed pages after the hype died down. 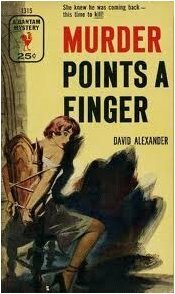 But during the late 1920s, Barker made a grand reentry into the publishing world and this time took a stab at the popular detective story – penning three novels that featured the celebrated crime expert Dexter Drake and his chronicler Paul Howard. 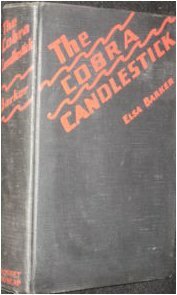 The Cobra Candlestick (1928) was their first recorded outing in the field of criminology, at least, one that filled the pages of a full-length novel and the opening chapters suggest strong influences from S.S. van Dine and Conan Doyle, but without falling into the trap of becoming a carbon copy of the originals – and nearly all of their faults were barred from this novel. 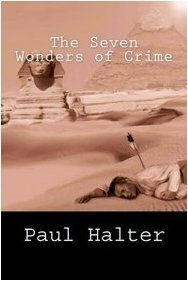 The first chapter has the tone of a Van Dine novel as the narrator, Paul Howard, reminisces over the case of the cobra candle stick, which he describes as the strangest case they worked on since he took up the position of Dexter Drake's personal assistance two years previously. Dexter Drake is not a dilettante who began meddling in murder cases merely to pass the time between cocktails, collecting rare artifacts and quoting obscure passages from curious volumes of forgotten lore, but established himself as an independent consultant who earned the admiration of Scotland Yard and the Sûreté – among other respectable police organizations around the world. Howard describes him as a debonair man of the world with black eyes that weigh everyone on invisible scales and he turns out to have an extraordinary faculty for languages, however, he lacked the insufferable character traits that would qualified the murder of Philo Vance as a justifiable homicide. Anyway, regardless of his considerable intellect and talent, he comes across as a nice and respectable person with a great deal of respect for professional policeman, who, in turn, are competent professionals instead of the bumbling, ineffectual idiots that Doyle interjected into the genre. The case commences when a messenger, named Percival Crumbie, arrives at their abode with a hastily scribbled note from his neighbor, Madame Marshbitter, containing an urgent plea to immediately come down to her home, situated in a rural area of Connecticut, where her only son was murdered in the library under inexplicable circumstances. John Marshbitter was on his own in the library, poring over his notes, when a well-aimed blow crashed through the roof of his temple, killing him almost instantaneous, but the exists of the room were under constant observation by various family members and guests of the house. Marshbitter's mother-in-law, Mrs. Frew, was lounging on the couch in the hallway, his son and daughter, Ted and Mary, were on the veranda outside and the man who rented their summer house, Nicholas Pogue, was in the next room playing on the piano facing an interconnecting door and they all swore that nobody left or entered the library during the time of the murder. This makes for a tantalizing problem, especially for such a distinguished and lauded detective as Dexter Drake, but a prior commitment necessitates his presence in Washington and he sends Paul Howard ahead of him to lay the preliminary groundwork for his investigation. 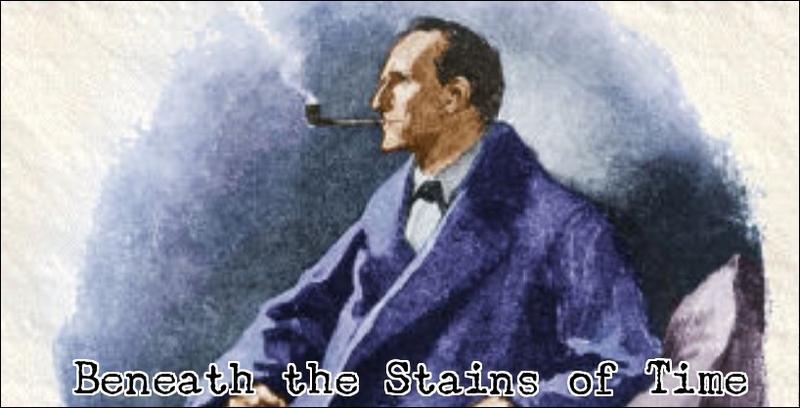 Consequently, the Great Detective is absent for a large portion of the book and this struck me a conscious nod to The Hound of the Baskervilles (1902), which, in turn, also gives Howard and Sergeant Doon an opportunity to shine as detectives – and upon Drake's return they are able to present him with a lattice work consisting of facts, clues and red herrings. What complicates John Marshbitter's murder is not necessarily the seemingly impossible nature of his death, but determining the truthfulness of the witnesses stationed at the exits of the library and the opportunities they had at their disposal to sneak in and deliver the fatal blow. This gives the book more of a how-was-it-done feel than that of a locked room mystery, however, it's a nifty idea to leave it undecided whether or not the characters are facing a classic locked room problem, which is even further complicated when the suspects began to drag red herrings across the trail – making it even harder to separate the real facts from the fabricated ones. I also found it amusing that every type of letter that can mystify a detective story turns up in this book: anonymous letters, threatening letters, unfinished letters and hidden letters. The outcome is a gratifying and complicated plot, which does a surprisingly competent job at directing attention away from the obvious suspect and dropping clues that played fair with the reader. The only blotch on the solution is that Dexter Drake withheld one piece of information that would've told you how the murderer escaped the closely observed library, but then again, once you suspect this person and have familiarized yourself with the facts you can, as an experienced reader of detective stories, pretty much guess how this trick was pulled off and roll your eyes at it. Much more rewarding is putting the sequence of events, leading up to the murder, in the correct order to form a complete and coherent picture of what happened at the Marshbitter estate. All in all, this book turned out to be pleasant surprise and was worth the gamble I made when I purchased it. The book modeled itself on detective stories from previous eras, but with most of their weaknesses, clichés and stock-characters absent and with shades of the ingenious plotting that became synonymous with detective stories from the 1930-and 40s – as well as a playing reasonably fair with the reader. There are still a fair amount of imperfections to be found in this book, but, in the end, it was far above any expectations I had of it. By the way, I was planning to lay off locked room mysteries until, at least, February, but then a special package arrived a week or two earlier than expected and I simply have to dig into them as soon as possible. "...from this it follows that the population of the whole Universe is also zero, and that any people you may meet from time to time are merely the products of a deranged imagination." Thirty-three years after publishing a very unconventionally structured locked room mystery, The Seclusion Room (1978), Dr. Fredric Neuman, Director of the Anxiety and Phobia Treatment Center at White Plains Hospital, came out with a sequel, Come One, Come All (2011) – which is synopsized as a "a locked room mystery, and a take-off on the locked mystery" as well as a "comic novel, but realistic." I mentioned this prospect of a new, potentially interesting impossible crime yarn in the penultimate paragraph of my review, but this news was received with a bit of skepticism from the proprietor of Pretty Sinister Books, John Norris. 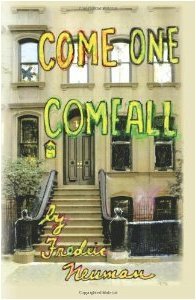 Come One, Come All is a chunky, self-published novel, but the only real faults to be detected were those of a typographical nature that one expects from a book that was wrung through the innards of an independent printing press and even these printer's errors were kept at a minimum – and with that I mean that I have seen much, much worse. This is a more than passable edition for a self-published novel, comparable to John Pugmire's self-published translations of Paul Halter's locked room mysteries, and the only real drawback is that the text is sparsely spread out over the pages, which gives it a bloated and off-putting appearance. I estimate that the actual page count would be around 250-300 pages instead of the 455 pages that it counts now. But now, on to the review! Psychiatrist Abe Redden, the main protagonist from the previous book, The Seclusion Room, is pried loose from his comfort spot, at Four Elms psychiatric hospital, to temporarily strengthen the staff of The Women's Health Center – where the winds of change are whipping up a storm in 1970s New York City. Abortion has been legalized and due to some controversial treatment programs, the health center is now under constant siege, from pro-life supporters and gay rights activists, but internally the place also rambles like a biscuit tin full of loose screws, nuts and bolts. The man who occupied the seat of director, Charles Wegner, was transferred to the morgue after a fatal heart attack, but a whiff of gossip can be detected in the corridors, suggesting that the director was poisoned, and one of their doctors, Tina Cantor, in charge of a controversial new treatment program, may be a nymphomaniac with literary aspirations – who seems to already have penned a best-selling, fictionalized expose of her private life under the nom-de-plum of Dr. Y. Naturally, she becomes the love interest of Dr. Redden, but he's also confronted with problems of a professional nature: there's a patient, checked in under the name Adam Adamson, who claims to come from 150 years in the future and knows from his time that Redden will end up burning down the hospital, that is professionally attached to the health center, but he's unable to remember specific details about this historic event in the making. Adamson's zany lectures on 22nd century life makes him sound as a writer for The Guide attempting to describe a futuristic incarnation of the human race, but then again, these short vignettes impressed me from the very start as an unabashed homage to Douglas Adams' The Hitchhiker's Guide to the Galaxy (1979). Adamson after all does mean "son of Adam." Yeah, it makes more sense if you have one of my mental afflictions, but you get my drift. Anyway, the first part of the book, roughly 170 pages, does not read like a detective story at all, but as a warped comedy of manners that is unable to restrain Murphy's Law and twists like a knife in everyone and everything that is brought up on its pages. It's not until the center is confronted with the physically impossible murder of their new director, Patricia Robinson, that the detective story begins to the feel the knifepoint pricking its jugular. Robinson was discovered behind the door of her examination room, locked with a key from the inside that was still in the lock when it was busted open, and the broken window only affords an easy entrance and quick exist with the aid of a ladder – not to mention that the alleyway beneath the window was guarded at each end by a policeman. At first, Dr. Abe Redden, backed-up by a few other characters, appear to approach this problem in a light hearted, comical way, throwing allusions around to Agatha Christie, John Dickson Carr and Rex Stout and proposing prosperous solution, such as an examination table that was fixed to propel Robinson head-first against a filing cabinet, but the actual answer to this locked room problem is as solid a put-down as the door itself! This joke-explenation, at the expense of the locked room mystery, was probably meant to be somewhat of a letdown, but the solution is so incredibly simple and rational that Neuman just might have come up with something completely new here. It's so simple, that it could've easily been overlooked from the time Edgar Allan Poe penned "The Murders in the Rue Morgue" (1841). I tend to like in the context of this story. Unfortunately, the other compartments of the solution, the identity of the murderer and the accompanying motive, proved to be far less interesting and suffered from under exposure and sparse clueing. But this hardly affected the enjoyment derived from the overall story, which, I think, says something about how much I have begun to enjoy Neuman's take on the detective story – in spite of the fact that they are awfully modern in tone and take frequent potshots at our beloved impossible crime story. However, Neuman seems to understand that you can bring up loaded topics, like abortion, religion and sexuality, in a detective story without overburdening your characters with them and make them wallow in angst for hundreds of pages on end. I also appreciated the fact that he didn't walk around on tip-toes and blatantly poked fun at everything, which is how it should be done. Hopefully, I have not over praised this book, but I completely enjoyed this funny, but also intelligent, take-off on the locked room mystery, the characters that wandered across its pages and its sense of humor – which hovered between darkly twisted and delightfully juvenile. Simply put, I found this book a riot! As the days that lead up to the one year anniversary of this place dwindle down, crossed off the calendar, one after another, like names on the guest list of Mr. U.N. Owen, it slowly began to morph back to its original incarnation – a blog that is dedicated to the great old detective stories of yore! There was a stretch of time when this place resembled a shrine for new-fangled, neo-orthodox mysteries, but it appears that the ghosts of past writers, such as Anne Rowe and Willy Corsari, reclaimed this digital mausoleum from the living. Well, they are about to welcome another revenant spirit, whose memory has faded like a neglected black-and-white photograph, in their midst. 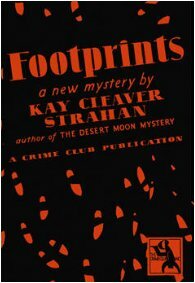 Kay Cleaver Strahan is one of those names that has been accumulating dust in the attic of our collective memories for decades, but nobody seems to remember why, exactly, this author was stored up there. I guess it was a convenient, spacious spot when they began tidying up the genre. 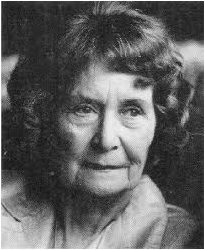 Strahan was a writer who designed a number of plots that functioned as the structural skeletons for seven mystery novels, which were, in turn, craftily deconstructed by a seasoned crime analyst, named Lynn MacDonald, and, from what I gathered, there was a different approach in storytelling in each of these narratives. 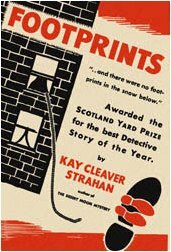 Her endeavors at finding new and fresh perspectives, to put a detective story on paper, were rewarded when her novel Footprints (1929) became the recipient of the Scotland Yard Prize – handed out by 100 independent booksellers that were affiliated with the Collins Crime Club for the best mystery of the year. Footprints opens in the present time, which, in this novel, is 1928, but spends most of its pages on looking back at a murder that was committed in the year 1900 and we are almost immediately confronted with a rather dubious and shaky confession. Neal Quilter confesses to his sister, Judy, that he has come to believe that it was him who was responsible for the death of their father, all those years ago, but the circumstances, in which the murder was carried out, won't allow this admission of guilt to stand. The Quilter's are among the best-known families in Oregon, whom transplanted their lives and family tree from the South during the Civil War, and lived together, as an outwardly happy and caring family, on a big farm known as Q 2 Ranch – until the report of a pistol shot ripped through their lives and awakened that ogre known as suspicion. This one shot was enough to wrench them all from their peaceful slumber, but they found themselves unable to leave their bedrooms – as their doors were all locked from the outside. The keys were later found in a pile on a table in the bedroom of Richard Quilter, who was dying in his bed from a gunshot wound in the chest, next to an open window with a rope dangling out of it. Richard Quilter, with his dying breath, murmured the words, "red mask," as he inclined his head towards the window, however, when the shot rang out it had stopped snowing for some time and the house was marooned in an expanse of unbroken snow – and there were rolls of undisturbed snow on the windowsills. This literarily threw the possibility of an intruder out of the window, but the absence of a gun in the room makes suicide as unlikely a possibility as murder and the case went unsolved for three decades. That is, until Dr. Joe Elm, the likeable family physician and friend, who shares the concern of his friends over the mental well being of Neal, decides to consult Lynn MacDonald – a renowned criminologist. Nearly thirty years have elapsed since the fatal bullet was fired and there's little left for her to go on. The house has been remodeled and refurnished several times, family members have died off and the intervening years have made the memories of those who are still alive unreliable, but the family does have in its possession two parcels of letters that were penned by the youngest members in the house, Neal and Lucy, to their sister Judy – who lived away from home at the time. Based on these scraps of paper, written by a child and disturbed young man, MacDonald has to come up with, not only, a possible murderer, but also gauge for a motive and figure out the method. The picture that emerge from these letters is refreshingly different from your usual, stock-in-trade dysfunctional family and showed a relatively normal family who are attempting to deal with problems that life throws at them. There's a less-than-popular in-law making an entrance into the family and there are financial problems that may force them to sell their ranch, but no stereotypical patriarchs ruling over the private lives and clutching the purse strings of the family with an iron first or fooling around with changed wills. It's a fairly realistic portrayal of a family during the early 1900s, or, at least, I imagine it is not an entirely unrealistic representation of such a family during that period in time and the biography of the Quilters, provided by Dr. Elms, is equally fascinating – placing this book in the Van Dine-Queen School of Detection. This detailed description traces the family history of the Quilter's all the way back to the settlement of America and their exodus from the South because of their commendation of slavery. Not to mention that it also introduces several plot devices that would resurface in the succeeding decades: Q. Patrick's S.S. Murder (1933) also uses a series of letters to relate the story, the retrospective look at a murder from the past foreshadows Agatha Christie's Five Little Pigs (1943) and Sparkling Cyanide (1945) and Ellery Queen (who debuted in the year this book was published) would make the dying message their trademark. The only thing that mucks it up is the almost Gladys Mitchell-like vagueness where the solution is concerned. There's an interesting false solution proposed towards the end before the actual culprit is revealed in the final sentence of the book, but this impressed me more as a guess than as a statement of fact. This last moment "surprise" left absolutely no room whatsoever to explain how this person was either locked into the bedroom or trodded over snow without disturbing its surface, although, if you know who is fingered for the murder you can pretty much guess the method. But it's a sloppy writing/editing job on the part of both the writer and editor. This is a shame, because up till the final pages this has been an excellent read and could easily become a favorite of mine – even with a routine solution to the impossible nature of the murder. All in all, this is a nicely written story that must have seem like a breath of fresh air at the time and some of its originality still shines through, which makes it worth picking up when you come across a dirt-cheap copy of the book, but the ambiguous (read: sloppy) ending should not make this one of your top-priorities on your wish-list. "It appears to be an impossible crime, but there are no impossible crimes, only misunderstood crimes." Wilhelmina Angela Douwes-Schmidt was born on December 26, 1897 in Sint-Peters-Jette (Brussels, Belgium) and drew her last breath more than a hundred years later on May 11, 1998 in Amstelveen (The Netherlands). She was brought up in an artistic family, as a daughter of an operatic father and a pianist mother, instilling a love for the performing arts from early childhood and destined her for a life in the spotlights, but it was a talent for the written word that brought her lasting fame and an international audience. 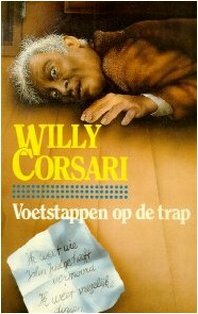 Under a fictitious name, that of Willy Corsari, she began dabbling in a variety of genres and themes, touching everything from psychological novels and stage plays to children's literary and detective stories – which were also introduced into the English, French, German, Russian, Norwegian and Danish languages. This puts her in the same league as Robert van Gulik and Appie Baantjer, whose books also scaled the language barrier into the welcoming hands of a whole new flock of readers, but neither of them, not even Van Gulik, was as classically styled as Corsari. The book I picked from her body of work, Voetstappen op de trap (Footsteps on the Stairs, 1937), to commence this Vintage Mystery Challenge of 2012, can only be described as a blend between the British whodunit, with a plot that has its roots firmly planted in the works of John Dickson Carr and Agatha Christie, and the continental roman policier. The key figure of this novel is Sir John Judge, born as Jan Rechter, who left Holland to find his luck in Britain and found it. As an entrepreneur, he put a considerable sum to his name and was even knighted for his business endeavors. Judge was also well-liked among his peers and threw money at people like candy to kids on the fifth of December, but the affluent philanthropist also harbored a darker, secretive side – one not known to his family and immediate associates but it garnered him a sworn enemy. While he was still living in his adopted homeland, a crooked man tried to kill him and were it not for the intervention of his close friend, Tjako Kiliaan, who took a bullet in the arm, he would've returned to his birthland in a casket. But in spite of the best efforts by those celebrated men of Scotland Yard, this mysterious individual, with his crooked appearance, was never collared and once more became a fleeting shadow from Sir John Judge's apparently unmarked past, however, it infused his wife, Anja, with dreadful premonitions and visions – which persisted to haunt her restless nights even after moving back to the Netherlands. These phantasms feed her fear and whisper to her that her husband is still in danger of losing his life to an assassins bullet, but when she asks, in her desperation, Inspector Robert Lund for help all he can do for her, at that moment, is come down to their estate, De Berkenhof, and talk with her family and friends. Inspector Lund, by the way, is the archetypical Dutch storybook detective from the pre-1960s period and comparable protagonists can be found in the mysteries from the hands of Tjalling Dix and Ben van Eysselsteijn, but Corsari might have carved the mold from which their detectives were cut. Lund is a regular homicide detective, "who looks even younger than he is," with a wife at home and got were here's now through competence and methodical police work. As I noted here, the Dutch detective story has not, as far as I am aware, an "amateur reasoner of some celebrity" or a nosy, scheming spinster who are constantly inserting themselves in murder cases or stumble over blood-spattered corpses. The detectives are always professional policemen. This has its advantages, but also its limitations. You don't have to over tax your readers credulity in order to place your detective in the middle of a murder mystery, over and over again, but on the other hand, a policeman is bound to his jurisdiction and thus limited in your settings (with exception of the occasional busman's holiday) – and our part of the genre really misses a memorable character like Sherlock Holmes. Anyway, back to the story! The nightmarish specter, that has haunted Anja ever since the attempted murder back in England, finally seems to have reemerged and presented itself in a solid form to confront her husband, however, the only occupant of the locked study, after the door was busted open, was the body of Sir John Judge – and his murderer had dissipated as rags of mist that were blown away by a gust of wind. The key of the door was still stuck in the lock from the inside, the windows were securely fastened and an interconnecting door was blocked, from both sides, by a bookcase stuffed with hefty tomes and a cabinet filled with porcelain. It's the condition of this sealed environment that, at first, suggests an accident, but evidence at the scene (i.e. a fresh bullet hole that can not be accounted for) indicates that his death is a murder, one that defies common sense, but a murder nonetheless. Lund finds himself not only confronted with a death that simply could not have happened, but also with an array of suspects who obviously belong on the pages of an Agatha Christie novel. There's Sir John's overwrought wife, Anja, and his carefree friend Tjakko, but also a limb and sickly looking secretary named Philip Gardner. Lady Cochat and her 10-year-old son Allan, who seems, at first, to have the personality of an automaton and the one who heard the titular footsteps on the stairs, and the frightened Mrs. Canna – who's is foully poisoned a day after the murder and mumbled a few cryptic words before sinking into a deep coma. There are more players, of course, but listing the entire dramatis personae here seems pointless. But take it from me that a line-up of the suspects resembles a stack of cards from the board game Clue. 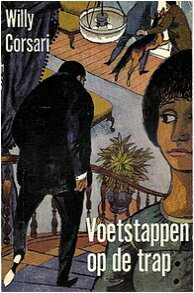 I never expected that there were actual Dutch detective stories, from the efflorescent era of the genre, that were this classically styled and ingeniously plotted – and even able to toy with me as if I were new to this game! I had a germ of an idea of what actually happened in that locked study, but I kept switching suspects and methods around on at least five different points in the book – which was encouraged with a barrage of twists and a false solution that told a chilling part of the actual solution. There were one or two coincidences that helped move the plot along in certain parts, but that hardly took anything away from the story and when the solution came it was a satisfying one. A nifty play on the least-likely-suspect gambit. It showed, quite clearly, that Corsari was aware what her fellow artists in crime were up to overseas and the ending of this story also impressed me as a nod and a wink at John Dickson Carr, Agatha Christie and Conan Doyle. But honesty compels me to point out two minor blotches: the third-person narrative does not read as smooth as could've been, especially during descriptive passages, and one component of the solution was withheld, but I am prepared to show leniency on that point – seeing as Lund was unaware of this, as well, and there were more than enough other clues to look at! 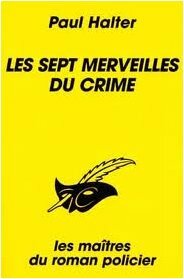 All in all, this was an excellent read and a top-notch detective story that deserves a translation, if it hasn't been already, and if you come across one of her translated titles I can help you help you determine whether or not it's one of her detectives. Well, that was the first book that I knocked-off the list for the VMC2012 and I think we're off to a good start. Not to mention that I can actually put a Dutch impossible crime novel on my list of favorite locked room mysteries now!